the thirteenth day of September 1864, (date of this muster,) for the term of Three years unless sooner discharged. Number of each grade. Names. 1..Every man whose name is on this roll must be accounted for on the next muster roll. 2. The exchange of men by substitution, and the exchanging, swapping, or loaning of horses after muster into service, are strictly forbidden. Infty. for the period herein mentioned; that each man answers to his own proper name in person; and that the remarks set opposite the name of each officer and soldier are accurate and just. 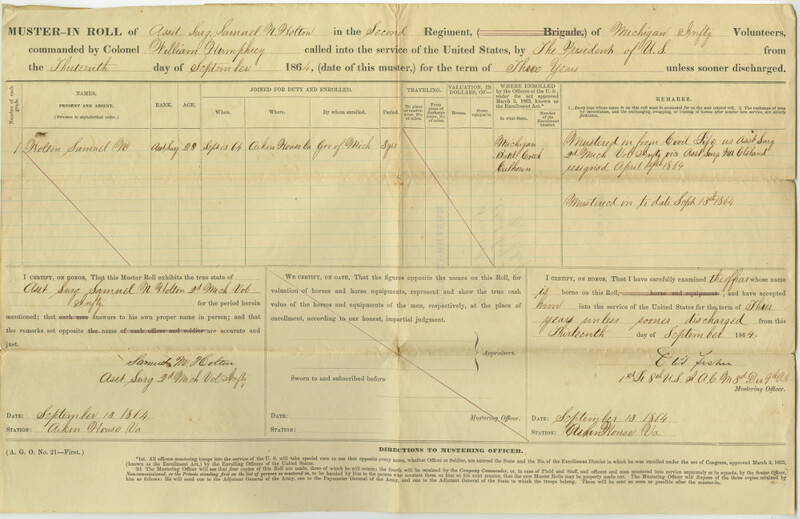 I certify, on honor, that I have carefully examine the office whose name is borned on this Roll, ……………horse and equipment, and have accepted him into the service of the United States for the term of three years unless sooner discharged from this thirteenth day of September 1864. 2d. 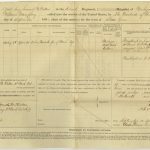 The Mustering Officer will see that four copies of this Roll are made, three of which he will retain; the fourth will be retained by the Company Commander, or, in case of Field and Staff, and officers and men mustered into service separately or in squads, bu the Senior Officer, Non-commissioned, or the Private standing first on the list of persons so mustered in, to be handed by him to the person who musters them or him at his next muster, that the new Muster Rolls may be properly made out. The Mustering Officer will dispose of the three copies retained by him as follows: He will send one to the Adjutant General of the Army, one to the Paymaster General of the Army, and one to the Adjutant General of the State to which the troops belong. These will be sent as soon as possible after the muster-in.